Proto “Glass” hacker Steven Roberts and the “Brain Interface Unit” for his 1991 nomadic “BEHEMOTH” bike project. The BIU offered a heads-up data display (via The Private Eye), a head-gesture-controlled mouse, radio communications and entertainment audio, spot and flood lights, a rearview mirror, and even a helmet liquid cooling system. The allure of wearable computing has been with us almost as long as the personal computer. Look through old PC magazines and you’ll find ads for ahead-of-its-time hardware like The Private Eye, a ’90s-era head-mounted display (HMD). We can also look to early examples of DIY “cyborgs” like Steven Roberts, the “high-tech nomad,” Steve Mann, the “father of wearable computing” who’s lived as a computer-augmented human for the past 35 years, and Professor Thad Starner of Georgia Tech, coiner of the term “augmented reality,” who’s worn a HMD for the past 20 years. 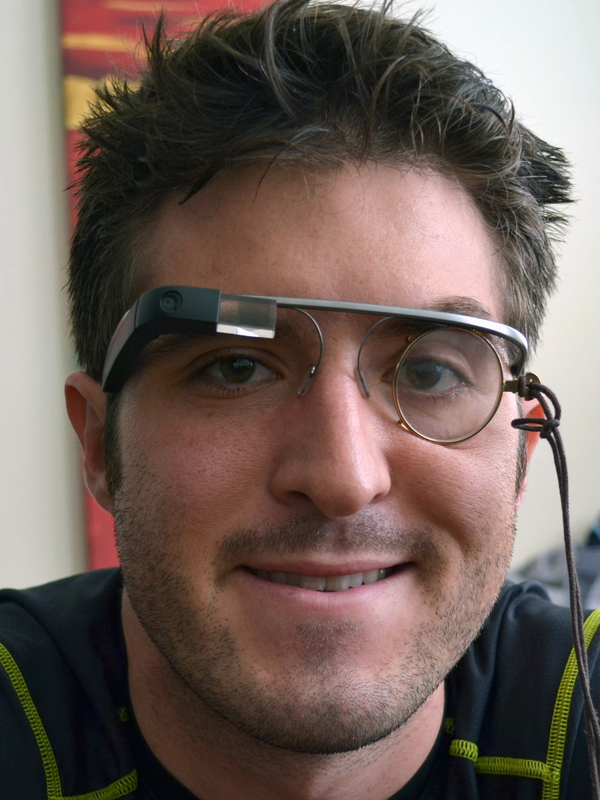 Starner even served as a technical lead on the Google Glass project. 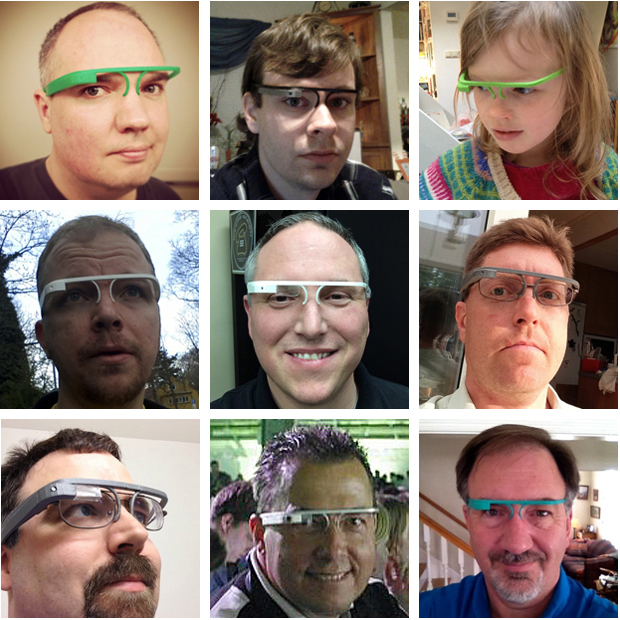 These maker pioneers didn’t bother to wait for Glass. They used the technology available at the time — costly, limited, and unwieldy as it may have been. They made the wearables they wanted to see in the world, as soon as they imagined them. And now, with the advent of Google Glass — the first widely available, affordable, net-connected computer glasses — today’s makers are being inspired to explore this emerging technology, to create their own alternatives, and to tear down, hack, and augment Glass itself. So What Exactly IS Glass? 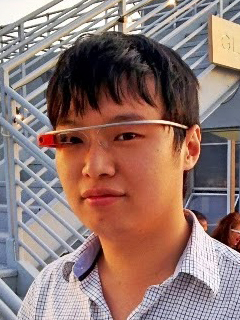 Basically, Glass is an Android computer that you wear like a pair of glasses. There’s a tiny head-mounted display in the upper right corner of your field of view and a touchpad that runs from your right eye to your ear along the stem. You use a combination of head gestures, touch, and voice commands to operate the system. The display is described as the equivalent of a 25″ hi-def screen from 8′ away. There’s a built-in 5-megapixel still and 720-dpi video camera, plus on-board wi-fi and Bluetooth so Glass can sync to your phone or a nearby network. Sensors include a 3-axis gyro, a 3-axis accelerometer, a 3-axis magnetometer (compass), and ambient light and proximity detectors. The latest version of Glass offers the option of adding prescription lenses to the (ironically) glassless Glass frame, plus an optional earbud (to use instead of the built-in bone-conduction audio). As soon as the invitation-only “Glass Explorer” program was launched, enterprising makers around the world hit their workbenches and began cobbling together their own versions based on Google’s promotional media and early demos. 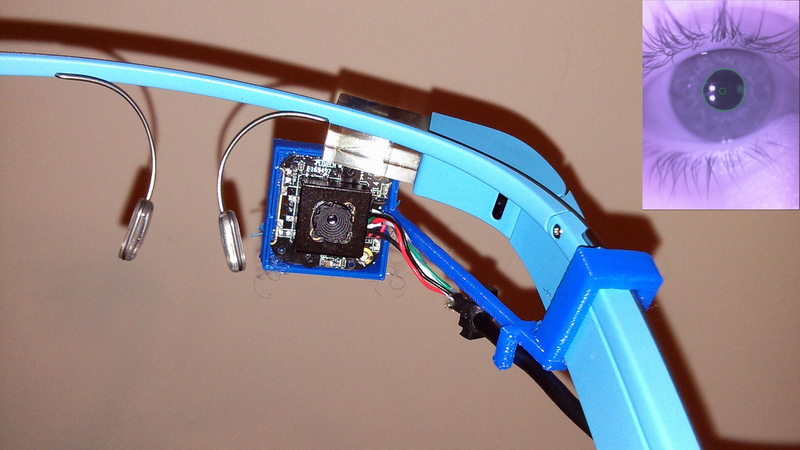 Searching “DIY Google Glass” nets a bizarre catch of phony Glass-like display demos, ridiculously clunky proof-of-concept hardware experiments, and humorous takes on Glass, as well as a number of interesting, earnest homebrew HMD projects. Myers, an Australian IT pro, tried to get a spot in the Glass Explorer program but got turned down and decided to roll his own. He’s now gone through six iterations, experimenting with different displays (chiefly using the MyVu Crystal 701), brains (iPhone, Nokia N9, Samsung Galaxy S, Beaglebone Black, and an Android HDMI TV stick), and frames. For the Android builds, he uses the apps Utter and Tasker to create a voice-controlled system that makes his glasses nearly hands-free. Versions 1–5 didn’t include a camera, but version 6 (which runs on the Android TV stick) includes a cannibalized webcam. Myers sees potential applications for his glasses among the hearing-, sight-, and motion-impaired, as his project uses voice and (eventually) eye-tracking, not touch or gesture. He’s hoping to attract interest from investors so he can develop his ideas further. Myers originally called his project Flass (“Fake Glass”) but changed it to MiDisplay after a run-in with Google IP. Furlan was another maker who didn’t want to wait for the “official” version of Glass. He created a very respectable homebrew HMD, also using MyVu Crystal for the optics. 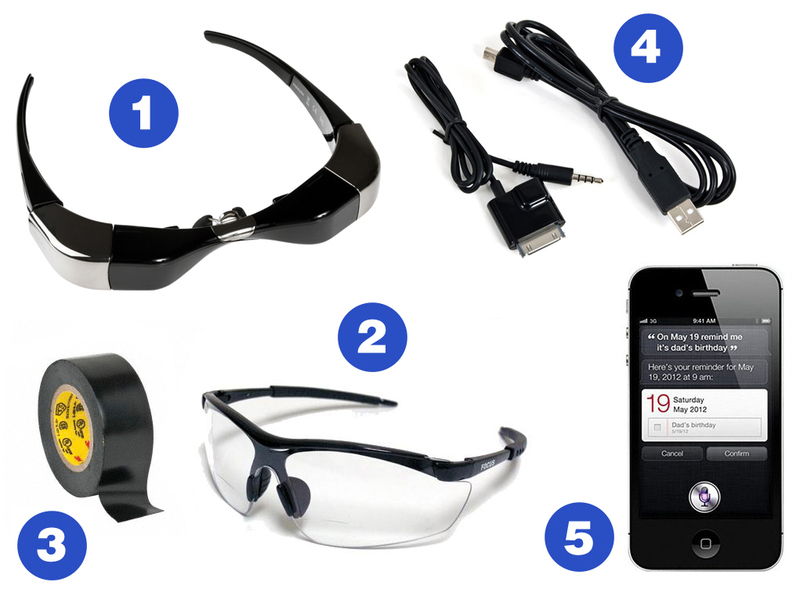 The display is mounted on a pair of safety glasses with a Looxcie Bluetooth camera, and uses an iPod Touch as the brain. Furlan passed on voice control, instead relying on iPod’s touchscreen for navigation, with a custom app to automate and aggregate common notifications (Facebook, Twitter, stocks, email, etc.) so he wouldn’t have to be constantly taking the device out of his pocket. Furlan says that though he started out skeptical of the technology, after wearing it for awhile he began to feel attached — taking it off produced a noticeable sense of loss. Even though his build is crude by Glass standards, it still gave him a taste of what’s to come. You can read in more detail about Furlan’s build on spectrum.ieee.org. to be productive. His build is well-documented on Instructables. When Van Tubergen created his “faux” Google Glass printable 3D model and uploaded it to Thingiverse, the idea was probably more of a joke than anything else — a way for those who didn’t get into the Explorer program to steal some of the limelight from early Glass owners. But it turns out that a number of DIY HMD builders (like Nathan Myers) have ended up using Van Tubergen’s model as the structural basis for their projects. To date it has been downloaded almost 15,000 times, and more than a dozen Thingiverse users have uploaded pictures of their own prints. Van Tubergen’s model, in turn, is based on an earlier SketchUp 3D Warehouse model by French maker Cathy Tritschler. Like all wearable tech, the head-mounted display market has struggled for years to find a foothold. Consequently, numerous commercial HMD systems have come and gone. This has been unfortunate for widespread adoption of wearables but a boon to hardware hackers looking for cheap tech to cannibalize, hack, and reimagine. Historically, input devices have been a major stumbling block for HMDs. Once you start adding air mice, chord keyboards, and/or handheld or wrist-borne keyboards/track pads, you quickly end up with a system that’s too clunky to be practical. The advent of widespread and reliable speech-to-text and voice-command software may finally get us there; a practical HMD input system is no longer that difficult to achieve, even for DIYers, who can use voice-enabled phones and other devices for control. A video display.There are a number of commercial video glasses out there. One of the more commonly hacked is the MyVu Crystal 701. It’s fairly easy to get one camera module and optics out of these glasses to use as a monocular HMD. Crystal glasses can be found on eBay and will run you from $100–$150, less if you get lucky. You’ll need to remove the camera module and optics for one lens and the cabling/connector. Something to mount it on. 3D-printed frames (see Joris Van Tubergen), or possibly your prescription glasses. Something to mount it with. Glues, screws, zip-ties, rivets, thumbtacks, possum spit, or whatever else gets the job done. Cables/connectors/adapters. As needed to get your display to connect to your phone. Voice-control software. Siri-equipped iPhones work pretty well for a lot of voice nav functions (and there are apps like Hands-Free Control that allow you to awaken jailbroken phones with a voice command). You can also use the button control on your headset to access Siri. On an Android, there are apps such as Utter and Tasker. SAD TROMBONE: Unfortunately, on a DIY HMD, you can’t currently access official Glass apps, which are designed, among other things, to feed you content preformatted for tiny heads-up displays. The APIs were open for awhile, but Google has since moved all the code into libraries designed to thwart their use on competitor devices. Some builders, like Rod Furlan, have made their own software, creating simple apps that feed them alerts and headlines and make their homebrew HMDs more “Glass-like.” As the hardware continues to proliferate, the software options are likely to open up again. Among makers lucky (and well-heeled) enough to gain early access to Glass through the Explorer program, quite a few impressive hacks, mods, and augmentations have appeared. 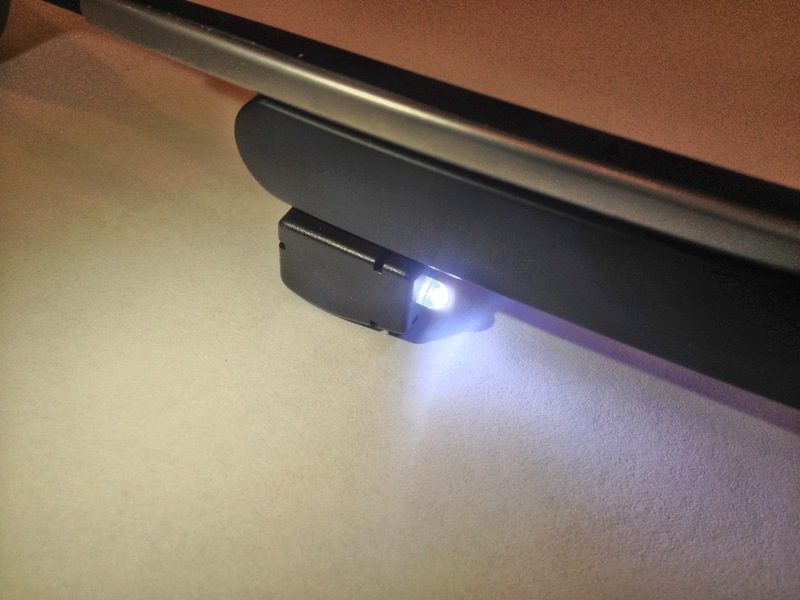 Former NYU/ITP student Sun has done several Glass-based projects, including a software-controllable clip-on LED flashlight. The prototype simply used a pin on the Glass’ micro-USB port to power a white LED and had to be manually plugged in when you wanted to use it. For version 2.0, Sun discovered that Glass supports USB-OTG (“On the Go”), allowing it to act as a host for other USB devices. 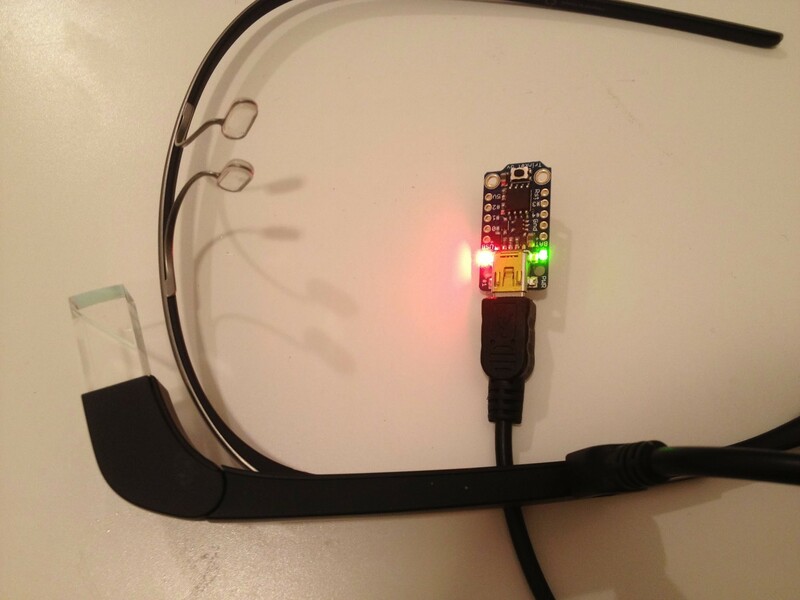 With it, Glass could issue commands to the light. He managed to find a tiny USB controller and fit the circuit inside of right-angle USB jack housing. On the software side, Sun had to get root access to his Glass, then install an app that translates voice-to-USB commands. Now his Glass has a handy voice-activated flashlight at the ready, and Deqing’s open-source project stands as a great jumping-off point for other custom hardware developers. Building on his success with “GlassLight,” Sun developed “Glass Trinket,” a project that uses Glass as a USB host for Adafruit’s tiny, inexpensive “Trinket” mini AVR microcontroller board. Connecting an external microcontroller opens up all sorts of possibilities for additional sensor input and other augments. Predator-style heat vision, anyone? Sun has also built a Glass remote control for use in very windy conditions, while wearing a scarf, in extreme cold, or when otherwise unable to use voice input. It’s built around Adafruit’s Bluefruit EZ-Key keyboard controller. More details are available over at Adafruit. Given that Glass can so easily and surreptitiously take photos and videos without those around knowing it, the technology has raised a lot of privacy jitters. Some bars and restaurants in Silicon Valley have even started posting “No Glass” signs. Artist and engineer Todd Blatt was quick to respond to these concerns (and poke a little fun at the Glass phenomenon at the same time) by creating a line of 3D-printed accessories. These include a brightly colored camera lens privacy shield (so people can see your camera is blocked), an old school “On Air” sign, and some other whimsical add-ons like cyborg-targeting crosshairs. Blatt says his original inspiration was the privacy shield (which he calls GlassKap), “But why stop there? If anticipating Glass has taught us anything, it’s that people have bold aspirations when it comes to tricking out their tech. Once I began, ideas flowed like Klingon Blood Wine.” Check out more of Todd’s work at custom3dstuff.com. Before anyone had donned Glass, Rod Furlan had already cobbled together his own HMD and tested the impacts of regularly wearing such a device, drawing his own (slightly different conclusions) as to why it’s relevant. Early on, he concluded that the real utility of Glass was going to be in the photographing and recording aspects, more than augmenting reality. Furlan imagines a future in which you record everything you do and can then play back your memories — an idea he calls “augmented cognition.” Though Google plays down the recording/photographing aspect over the AR features, augmented cognition is something wearable pioneer Thad Starner has been championing for years. It’s still unclear what the general public will make of Glass or whether wearables in general will finally enjoy their breakout moment. But for makers, this emerging space is a great sandbox for trying things out on-the-cheap, expanding the limits of the technology ahead of corporate R&D, and moving toward a new technology on their own terms.